There is something special about night time and the going to bed routine. Parents all through out the lands cuddle with their children and grab a book to read. Personally some of my favorite books over the years to read at bedtime are those with a going to sleep theme. Monsters Go Night-Night is a cute book that tells you all the crazy things monsters do to get ready for bed. Things like brushing their teeth with an octopus! The book circles back around with a few 'normal' things like going potty and kissing their parents good night. It is just a fun book perfect for bedtime! Bedtime means brushing your teeth, putting on pajamas, snuggling, and kissing your family goodnight. For monsters, bedtime looks a little different. They brush their teeth, but not with a toothbrush. They get dressed for bed, but not in slippers and nightcaps. They snuggle, but not with a blankie or a teddy bear. Monsters Go Night-Night takes readers through the bedtime rituals of seven friendly monsters while making each step of the routine a guessing game. Getting ready for bed has never been so much fun! 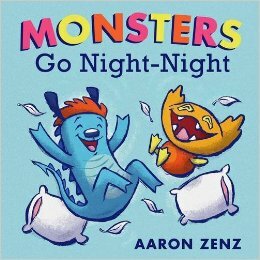 One lucky reader will win a copy of Monsters Go Night-Night! We read 1 book before bedtime each night. I don't have kids yet.